As part of our topic on Spain year 5 had a special visitor, Rosetta, from Spain. 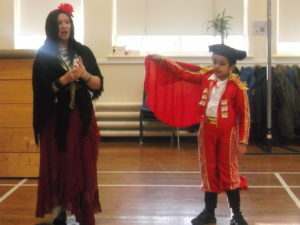 Rosetta arrived dressed in a tradition Spanish costume and explained to the children what the clothing meant. Next she helped the children create a timeline of Spain’s history with the children using props to illustrate the main historical events. Then the children acted out a Spanish folk tale with dragons and swords! 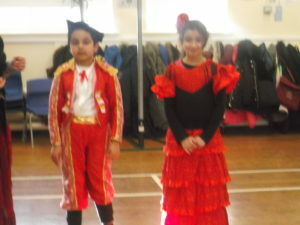 After our acting 2 children were picked to dress as traditional Spaniards. 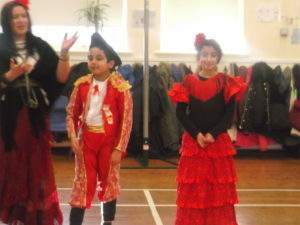 When dressed, all the children and staff where taught the basic steps to Flamenco dancing! This interactive workshop was a great way for the children to experience a different culture in a fun way. A great day was had by all year 5.